Rhubarb – A Far Cry from School Dinners! It is the latest thing, gracing our televisions, fawned over by celebrities and decorating the covers of magazines across the country. 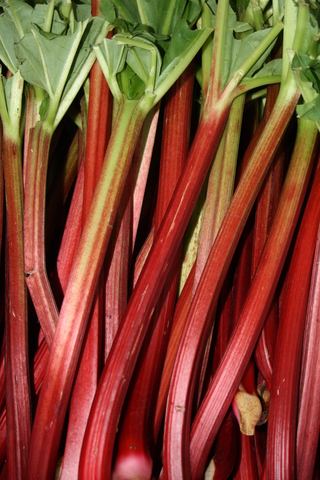 Yes of course I am talking about the international sensation that is…rhubarb? Yep, turns out that ever since the rise of gourmet shows like Masterchef and The Taste, people have been looking for more and more innovative ways of cooking veg as well as new veg to cook. This has, some would say inevitably, led to that old gardeners pal rhubarb being rediscovered and launched into culinary stardom. And with it promising to be a great year for rhubarb, when better to plant some in the garden. The glorious colour of ripe, sweet, sharp rhubarb! Now, it wasn’t too long ago that enjoying the summer bounty of rhubarb was not a complex proposition. When I was a young lad, school holidays had many treats but one was very special. What could be better than sitting in the back garden on a hot summer’s afternoon with a stem of freshly pulled rhubarb and a little ‘poke’ of sugar? The natural sharpness of the rhubarb with just a little extra sweetness turned it into instant sherbet, only better – Willy Wonka eat your heart out! Or perhaps your rhubarb tinted memories favour that ancient bastion of Britishness – the crumble. No I do not mean what some slightly upmarket restaurants would call a rhubarb crumble, all neat and elegant on an octagonal plate with a thimble sized edible jug of crème anglaise on the side. I mean the paving slab of crumbly yumminess on top of copious amounts of rich, oozing stewed rhubarb, all submerged in a lake of a good custard…(you can’t tell but the Union Flag has been wafting behind me for this last bit with Land of Hope and Glory playing in the background!). Or maybe, your favourite rhubarby treat is simply stewed with a drizzle of cream. However it is prepared though, rhubarb has been a family favourite since before most of us can remember. However! Enough of this nostalgia; we’re not in the past or the present any more people…this is the future! And rhubarb is back at the foreground of culinary pioneering, possibly as it never has been before. We all know that rhubarb goes wonderfully with ginger in a jam or a pudding, but in a curry?! Yes, according to scissorsandspice.com it is not only possible but delicious. Rhubarb’s natural tang with French lentils and mustard seeds, alongside sweet potatoes and red peppers (go to scissorsandspice.com for the full recipe) makes a comforting, flavourful and surprisingly rhubarby main course. But that’s not all – We’ve got chutney’s being made from rhubarb to go with pork (rather splendidly I might add), it’s going in salads with goats cheese to add a tangy crunch, and back on the dessert front it has made the transition from good-old-fashioned comfort food to glossy mag featured elegance, properly this time. Rhubarb jellies with ginger cream, rhubarb alongside a creamy vanilla pannacotta, even coconut is teaming up with rhubarb in a meringue tart for a fluffy light puff of sophistication (get these recipes and more from deliciousmagazine.co.uk). Yes it’s a new day for rhubarb and, if you enjoy growing your own in an allotment or at the bottom of the garden, that summery treat you’ve been waiting for just took on a whole new range of possibilities. So if you are, like me, a lover of the grand old ‘barb maybe think twice about going straight for the old staples and try something a bit new and daring with the king of the summer crop. For more recipes check out www.bbc.co.uk/food or just search for “new rhubarb recipes” there’s plenty out there. Call now to arrange your initial consultation.